I know it has been ages. Can’t even remember the last time I even posted. Anyone care? Oh well. I’ve always thought of my blog as a bit of an online diary. I don’t exactly share the deepest of secrets but it’s been handy to track various milestones. Facebook has filled that role recently but I’ve never been a big fan of it and even deleted my account at one point. But I miss blogging so here goes. Maybe I can keep it up for more than a once yearly posting. Been an interesting year or so. My position at Credible is going very well. I love my job and my coworkers. The recent offsite in Cambridge MD was great. The hotel was beautiful and we had enough personal time outside the meetings to relax a bit. Best yet I had good quality time hanging out with my bestie/boss outside the office. Okay so the 9 or so hours in the car to and from MD is plenty of time but that’s different. I enjoy his company. 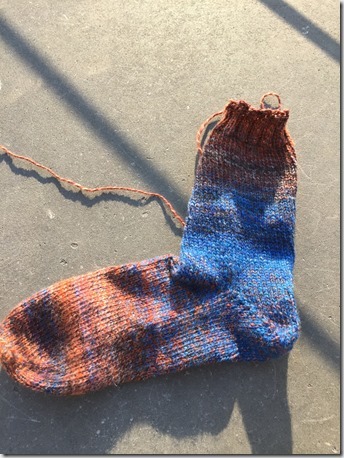 Still knitting socks. Started this pair in early April iirc. 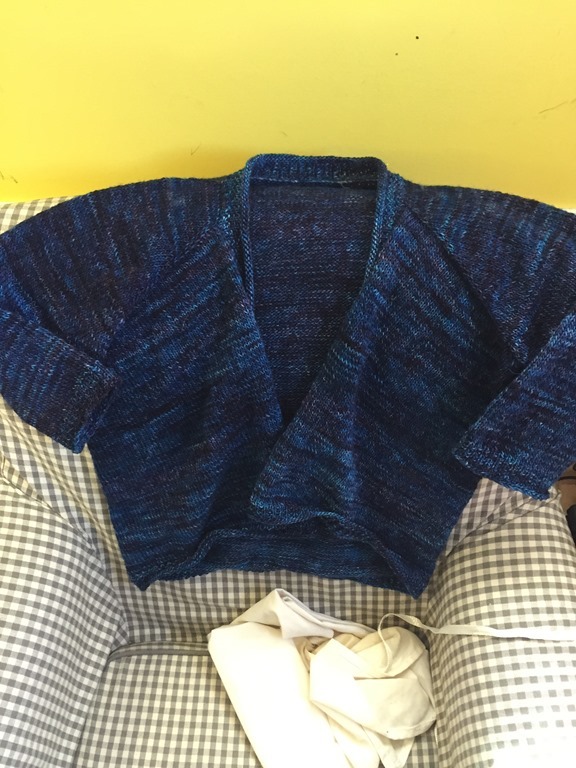 The yarn is Shalimar Aerie Jubilee. 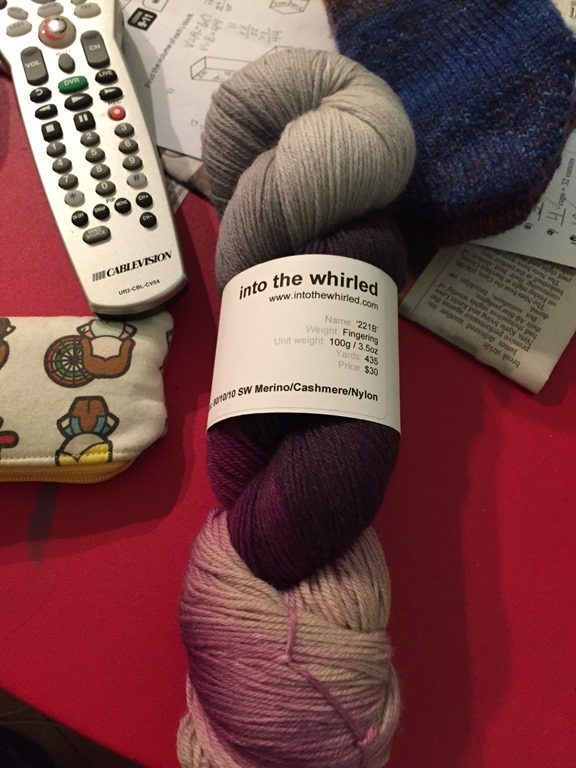 I picked it up in a new to me yarn store one day after work in Rockville. 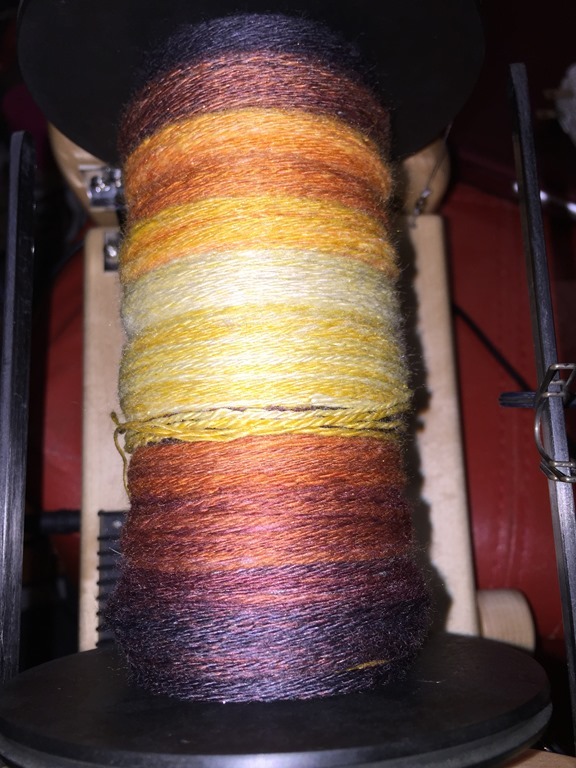 Blend is a 70/20/10 super wash merino/kid mohair/silk. I have the first sock done only finishing it two weeks ago. 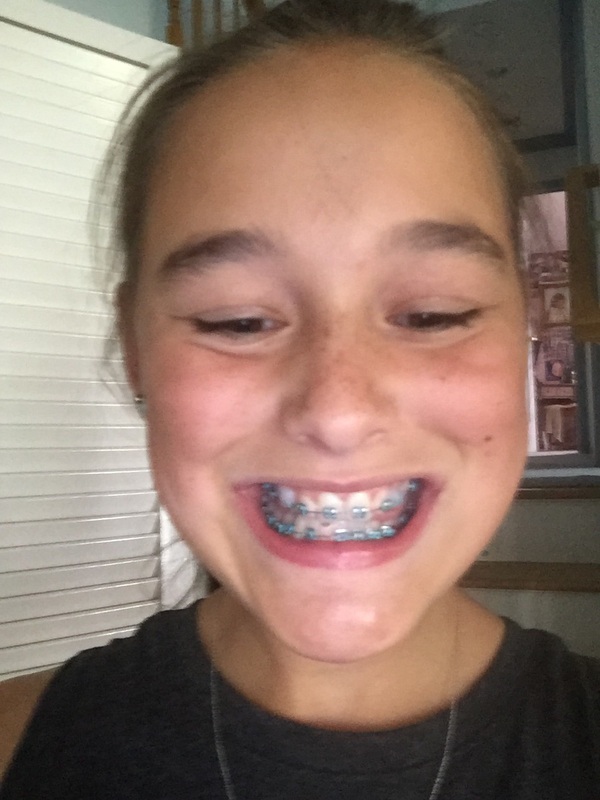 Kathryn got her braces this week. Alex gets his in September. Aren’t I lucky? They’ve always done everything together, why not braces. Thank goodness for orthodontics coverage and a FSA. Weekends are freakin exhausting. This has been a great weekend but oh my am I tired and ready to go back to work tomorrow. Yesterday was a day with friends and motorcycles. Rikki’s kids spent the last week with us. It was really nice to see the girls. Can’t remember the last time I saw my nieces. From my exposure after work, all the kids got along well during the week. Friday nights Rikki came after work. Saturday more, she and I headed to my buddy Art’s house. 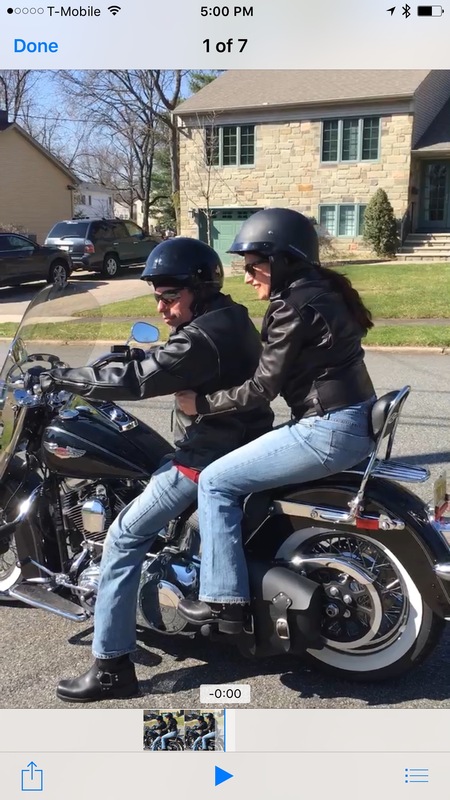 She drove my bike, happily I might add, while I drove my car. Once there I put on my motorcycle gear and climbed on the back of Art’s bike. 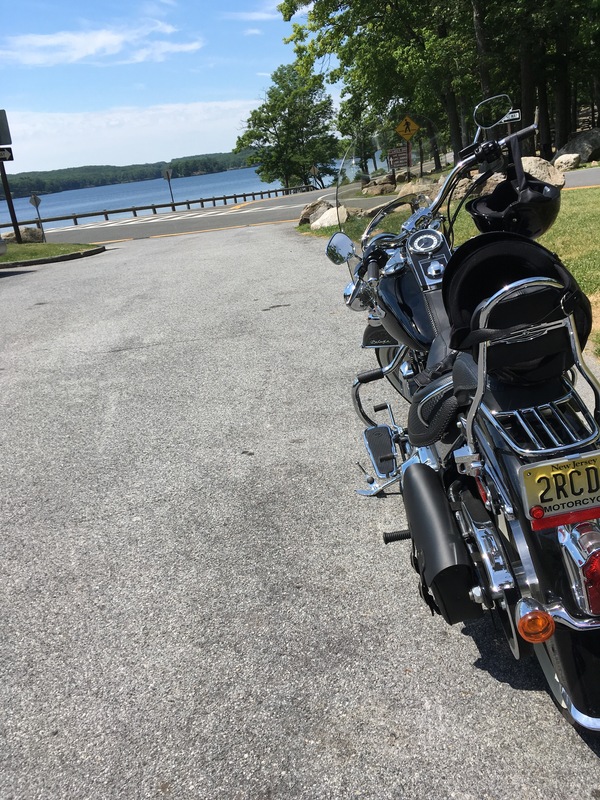 We drove to Starbucks for a drink and then up to 7 Lakes Drive in Harriman State Park, which is a lovely ride. We met up with another Harley rider. What a friendly group they are! After a break we got back on the bikes and headed to a parking lot where I drove my bike for a little bit. I was tired and not feeling it so I quit quickly before dropping the bike and hurting myself again. Hey a first for me. Back to the house for cosmos and snacks!! I left my bike at his house and head home in the car. 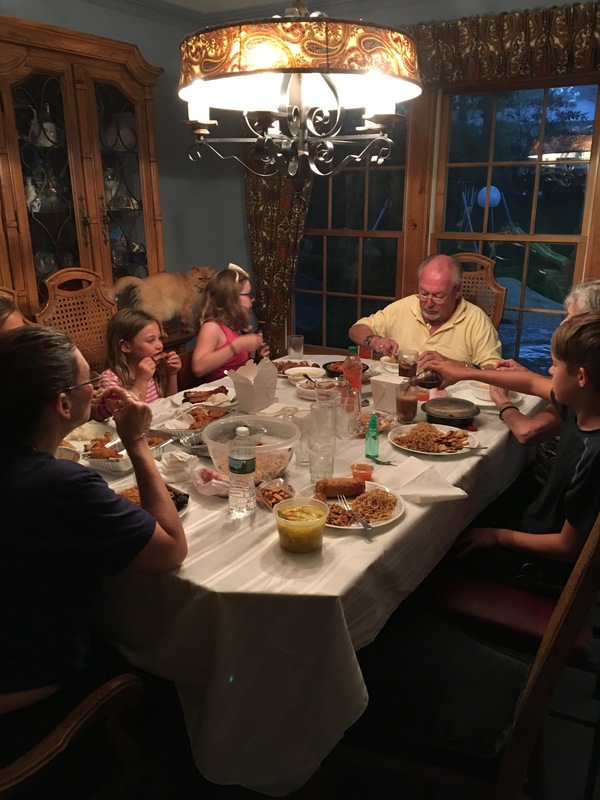 We had a traditional Jewish dinner favorite of takeout Chinese in the dining room! Today I was up early and did my normal Starbucks run (in the car) at 6:30. 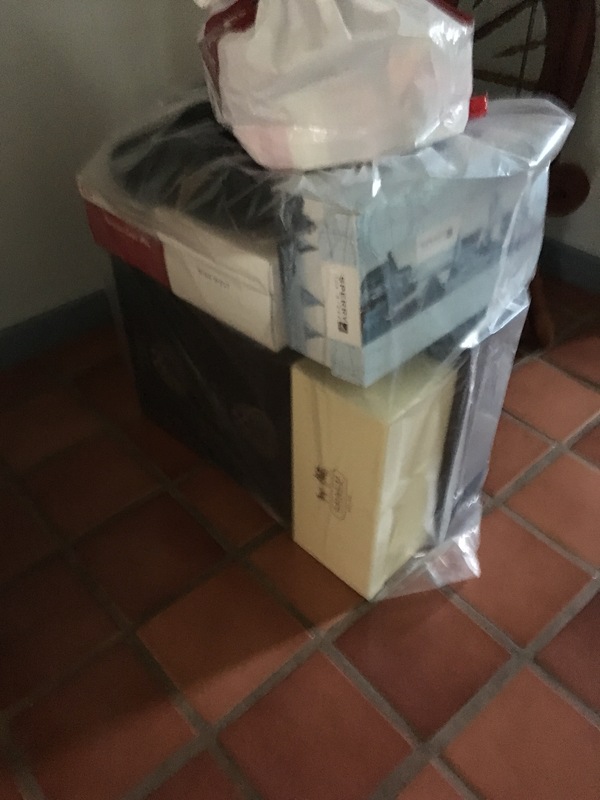 Bike got delivered at 8:30 and I drove Art home, where I picked up an extra office chair and my Frye boots which his wife had cleaned and waterproofed for me. How awesome is she?! Rikki and I then hit up Lowes where I got a closet organizer and have spent the rest of the day redoing my awful closet. My room looked like an explosion happened! 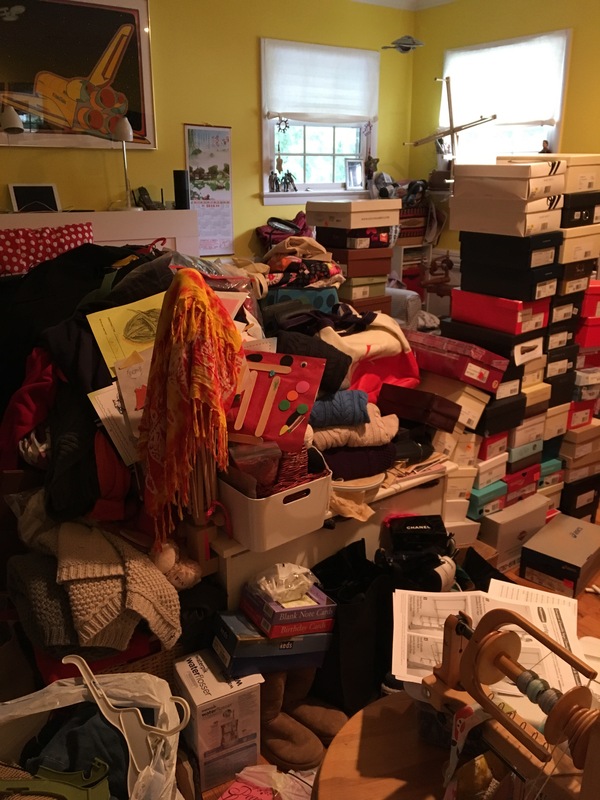 I was ruthless in sorting the shoes and clothes to see what should remain and what could be donated. Some three dozen shoes didn’t make the cut along with a lot of clothes. 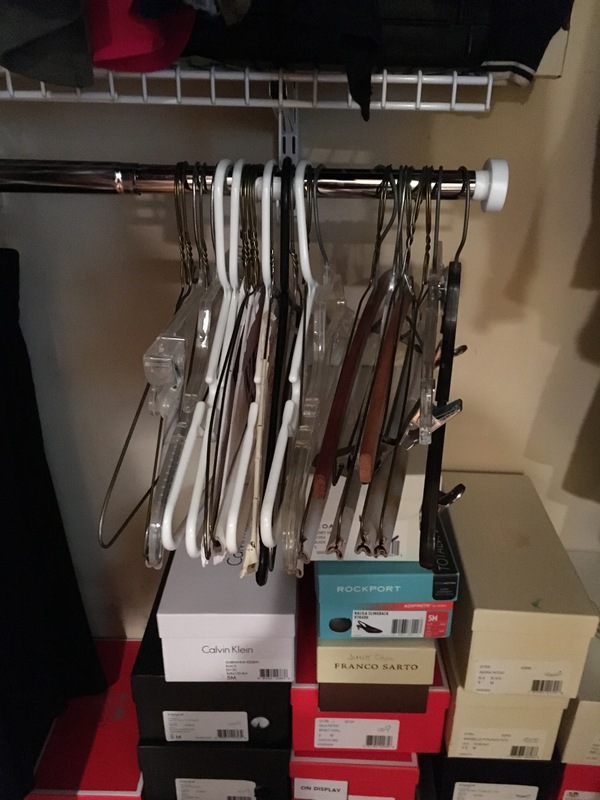 I have lots of empty hangers now. There where more but I tossed them or broke them in a fit getting them out of the closet :). Seven hours later and I am finally done. Oh yeah I finished the Boss Socks which he wore yesterday :). Always nice to see the hand knits get used! 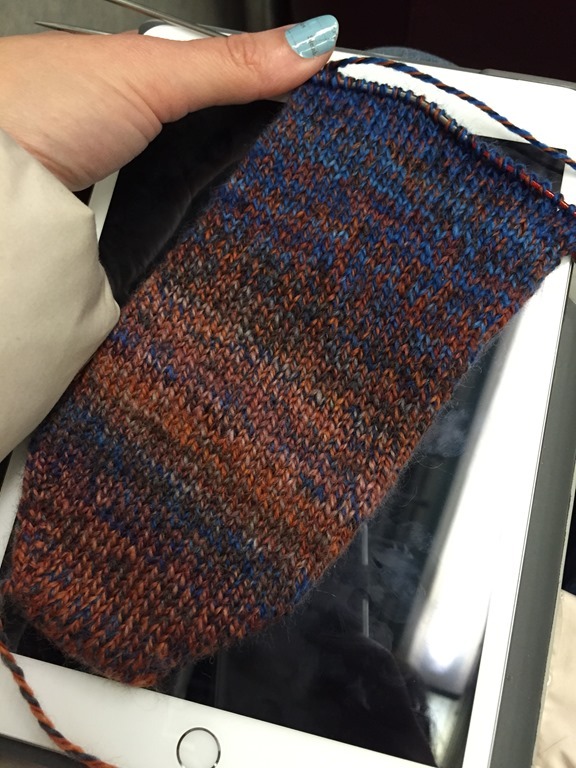 Sock progress is slow but that’s because I haven’t been knitting all that much. Sure I spend about 3 hours every day as a passenger in a car but for some reason I don’t really knit. Don’t get me wrong I get twitchy when I don’t bring it with me. But it sits on the floor with my bag most days. 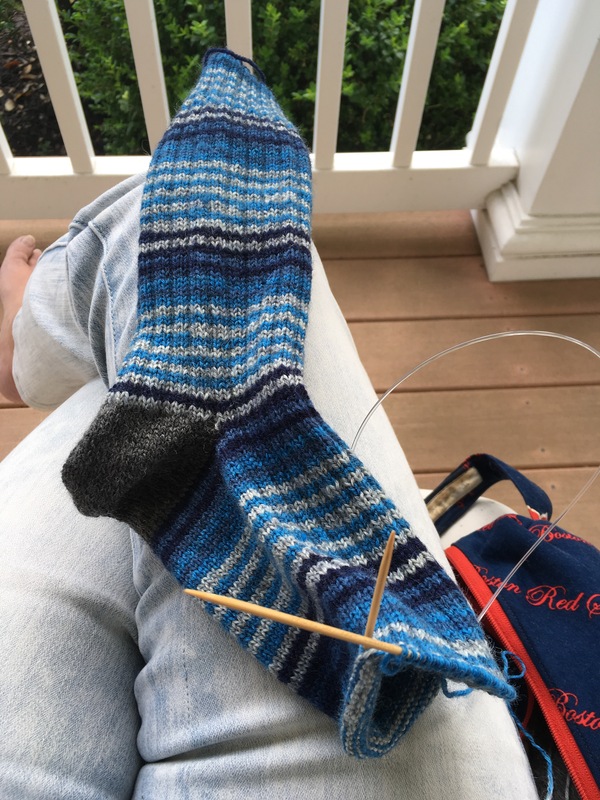 I actually have been working on one of the other two sock projects and turned the heel on the .1 sock yesterday morning while waiting for my ride. 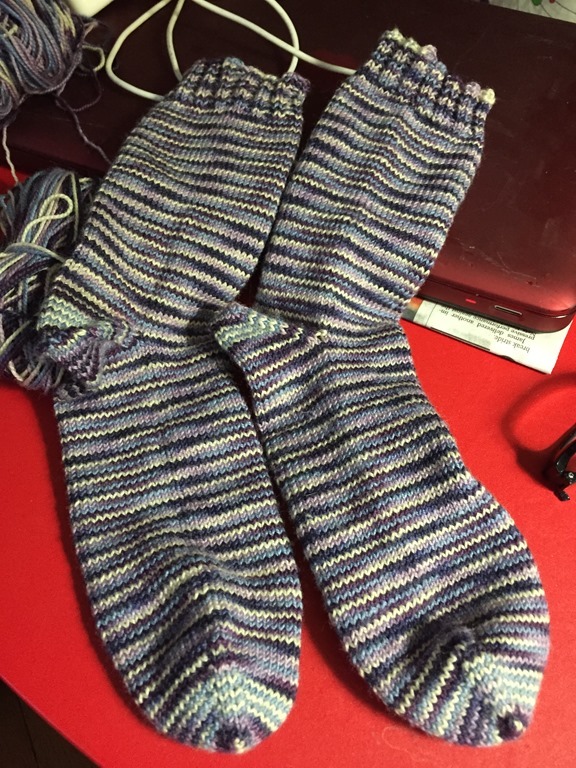 Tonight at dinner with the family I finished the cuff on the boss socks. One more sleep and we are off on the cruise! I have so much to do as I haven’t started packing yet and I need to be on the road by 9am tomorrow. Ugh. Look posting again less than three months! That’s because I have actual knitting progress to show. 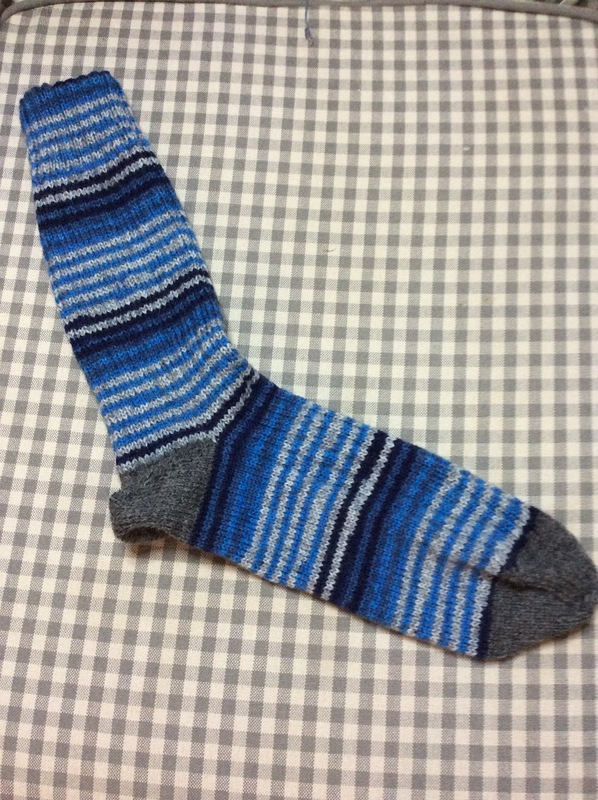 I finished the first of the Mr. Pitt’s Socks on Sunday night. I even cast on for the second one and am halfway through the cuff ribbing. While I wait to be picked up in the morning, I’ve recently been sitting on the porch doing a bit of knitting. Contrary to past practices I’ve currently got three different sock projects in the works. This pair is dubbed 2016.1 Socks. I started using that nomenclature so that I could immediately tell how many socks I do each year. 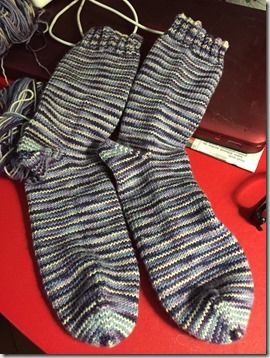 This is the second in the pair and I think I might finally concentrate and finish this pair. They’ve been hanging around for a while judging from the .1 in the name ;). Finally here’s a gratuitous kitten shot because they are so cute. 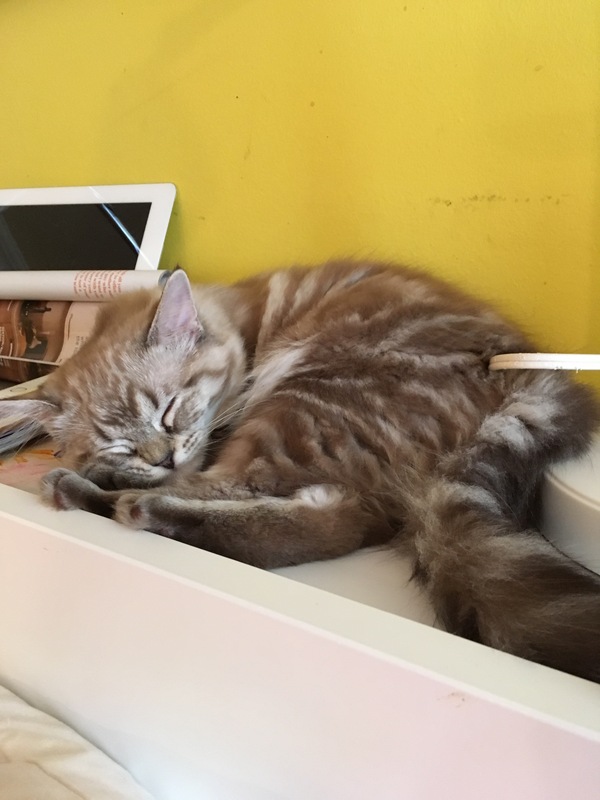 Miss Cocoa is sleeping on my headboard between my iPad and lamp. Marshmallow is rather fond of the same spot and sleeps there at night. Rides almost here so it is time to wrap this up. Been meaning to post for quite a while now but as in the past the longer it is between posts, the harder it is to do so. There’s so much that has happened that it is hard to know what to actually write about. Well that and Facebook has made itself the place where the quick blog posts used to be. So for my Facebook friends, posting would be duplicating the info. Now you know why I haven’t posted in forever. I’ll eventually figure out a balance not that anyone other than me reads this anyway. I’m good with that. The blog has been more of a journal for me than anything else and I do search it somewhat often. Going to do a quick review and maybe return to quick posts rather then FB snips. 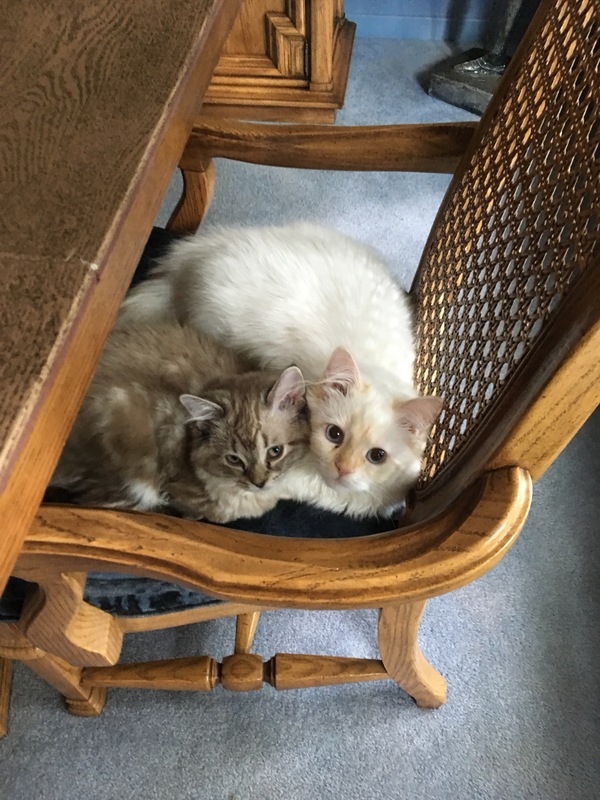 Seeing as my last post was about having to say goodbye to Earl, the first update should be about the two new kitties that we’ve added. First to join us was Viscount Marshmallow (the fluffy dude on the right). He’s a purrdoll- half Persian, and half Ragdoll. He was born December 1,2015. I drove go Pennsylvania in February to pick him up from a breeder I found. He is quite the character and tormented Serendipity so much that I got him a kitten. Early May we added the one on the left: Countess Chocula, born February 24th iirc. She is a full Ragdoll and is a chocolate Lynx mink color point. This one is a spitfire and reminds me a lot of Duchess. After a rough introductory weekend, the two became best friends. Where one is you can usually find the other. Boy are they wrecking havoc and seriously entertaining the family. Missed having kittens in the house as it was 10 years since Serendipity joined us. I was initially terrified but relaxed enough to get an understanding of the appeal. 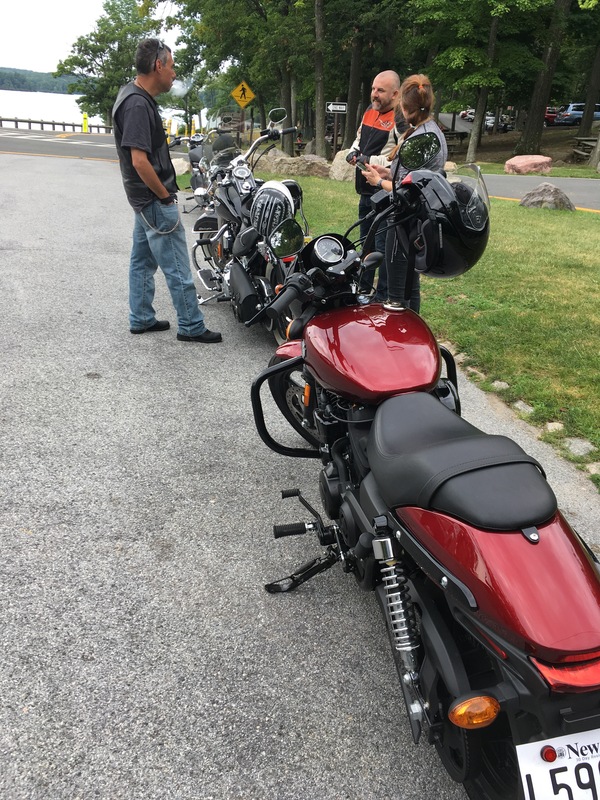 I got a second ride in early June up to 7 lakes drive in NY and really got it. I then signed up for the basic motorcycle class and while waiting for the start of it put a deposit on a bike :). It was a beautiful thing but having a less than successful completion of the class (dropped the bike twice -the second time was bad enough that I didn’t complete the class having bruised the heck out of myself and dislocated a couple of ribs) I changed to a better starter bike. July 1st I bought a 2016 Harley-Davidson Street 500. 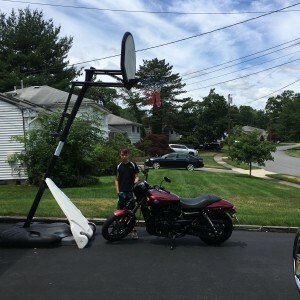 It had all of 1 mile on it as the first owner won it but wasn’t a rider and didn’t want to be. So the dealer was selling it as used on consignment. I got a good deal on it. 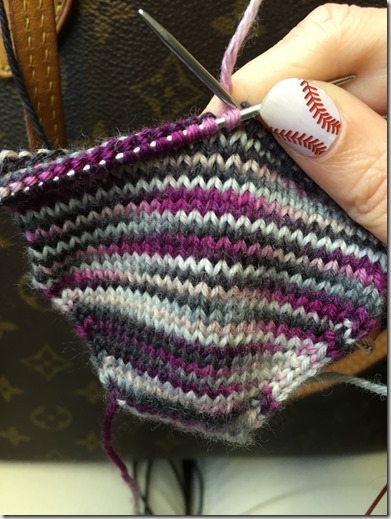 Oh yeah I do still knit! This is the first in a pair for the aforementioned boss/friend. He’s supervising my learning to ride (something that is readily apparent that I need judging from the assorted bruises), not to mention driving me to and from work since sometime last fall. Yup, no more train for me. 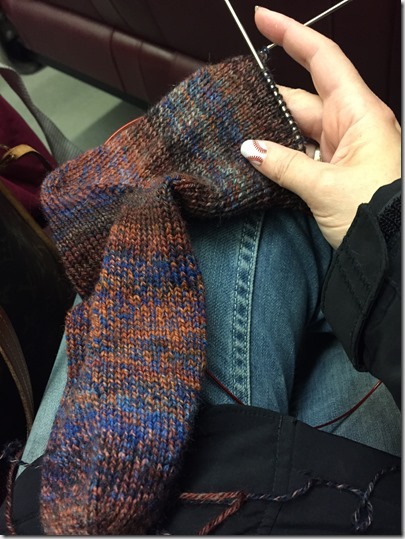 I now knit in the passenger seat of a car! 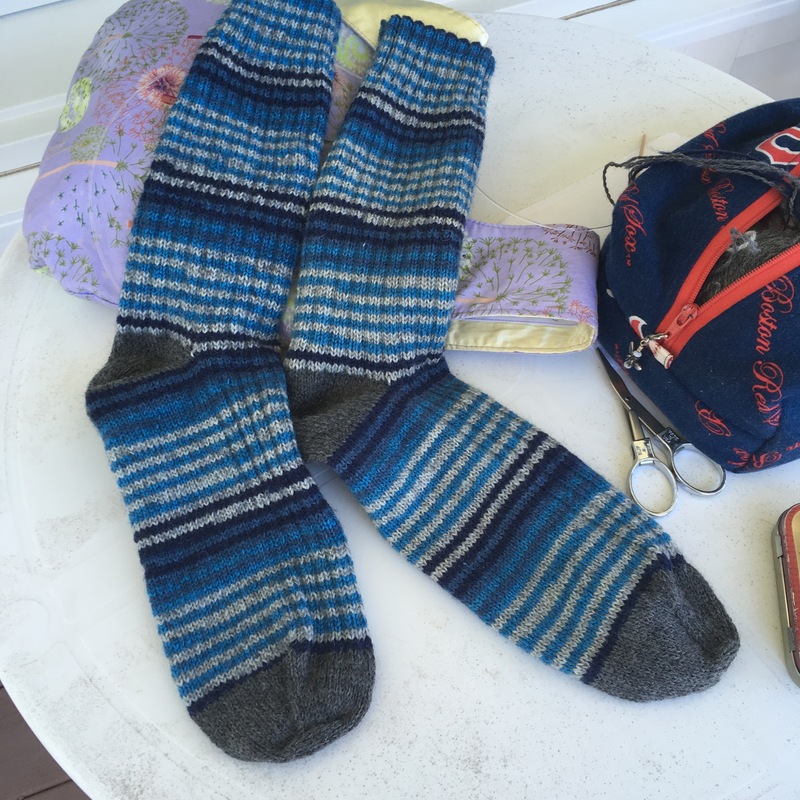 Anyway the pattern is Mr. Pitt’s Socks, which I thought was appropriate considering who they are for! 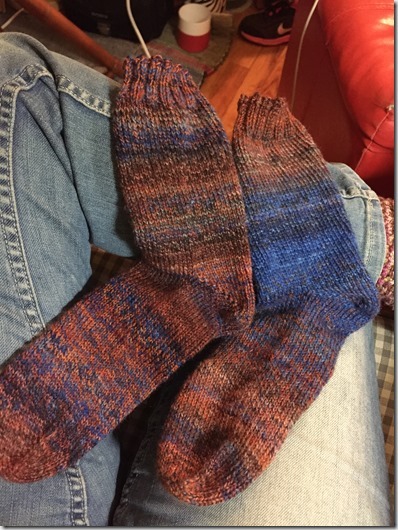 The yarn is Patons Kroy with Cascade for the heels and toes. 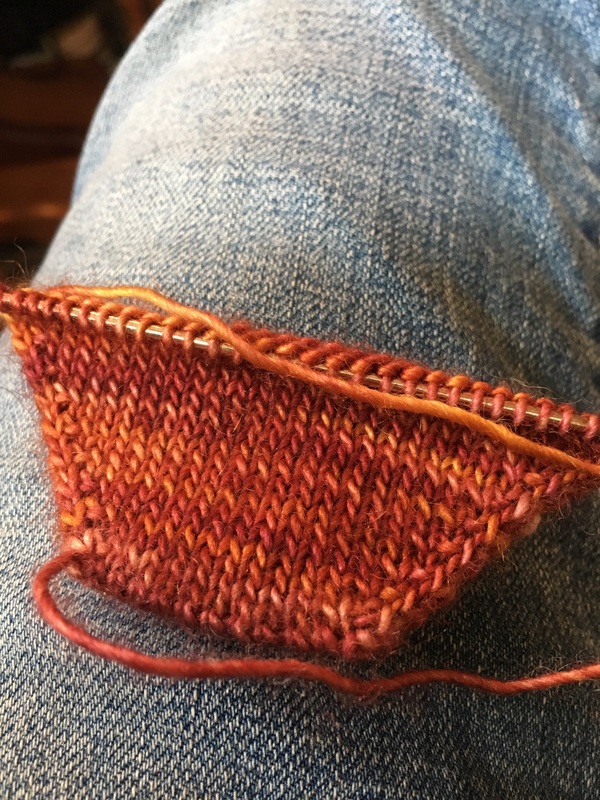 Could only get two skeins in this color so figured I would modify to use the short row heel instead of the flap and sub a coordinating color. About an inch from the toe now. I think that’s a pretty good recap for the 5 mile view since February. I’m going to try to post on a more regular rate. 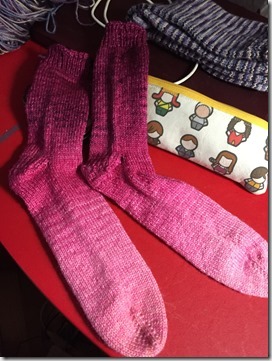 As predicted, the socks, they are finished. I bound off on the train home last night. After dinner I wove in the ends and proclaimed them finished. Most definitely fraternal twins, of which I am definitely partial 😉 It was definitely nice knitting with my handspun again and I must remember to do it more often. Having to go sifting through the stash to see where I hid it all. Project details are here. The yarn is from itw, colorway is 221B in a SW Merino/Cashmere/Nylon. This had to be a festival purchase. Your guess is as good as mine as to which festival, though if forced to guess, I’d say MDSW 2014. I wound it up last night while helping Kathryn with her homework and explaining Operator Precedence. I don’t remember learning that in 5th grade. She was having problems getting the order right based on the mnemonic that she learned in school that had multiplication taking precedence over division and addition over subtraction. Fortunately, I was able to guide her to safety, and had a wound cake of yarn ready for this morning’s commute. I cast on after getting on the train and took this picture as the ferry was approaching the pier. These socks will be 56 stitches on a US0. And I have to say, awesome game yesterday! I didn’t even touch the thing over the weekend. I was busy doing other stuff, like support spindling, starting a secret project, fixing the Pegasus and a pile of laundry. 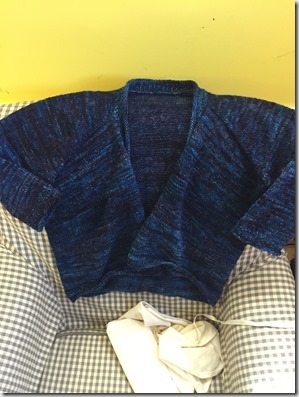 I made pretty good progress this morning and when I head home this evening, I shall be starting the ribbing. And in celebration of opening day (which should be a holiday! ), I changed my wraps last night. Woot. 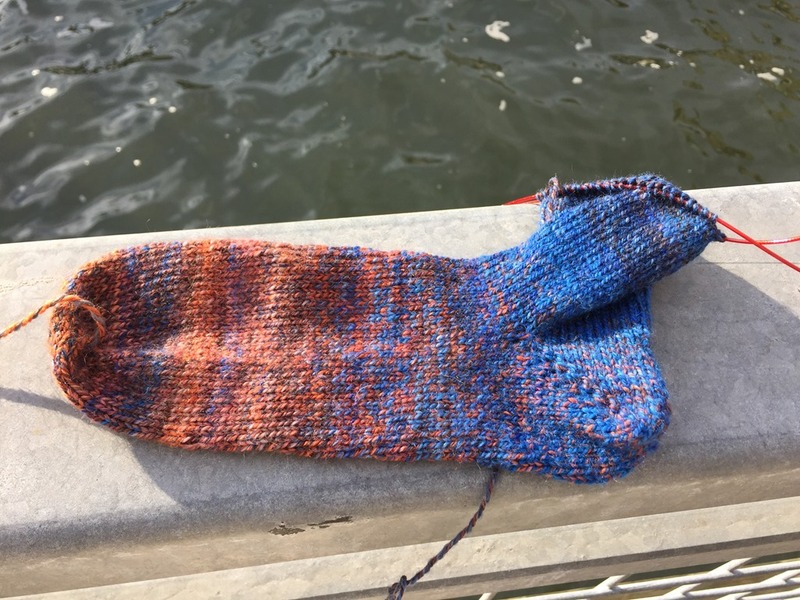 Thanks to actually concentrating on the sock, and a bonus amount of knitting time last night as we went out for dinner, I finished the first sock while on the ferry this morning. Here it is lounging next to the ferry pier after I got off the boat. Thanks to the early A.M. sun actually shining, the colors are a bit washed out. The blue reads a much deeper blue. I’ll cast on the second sock on the way home tonight. 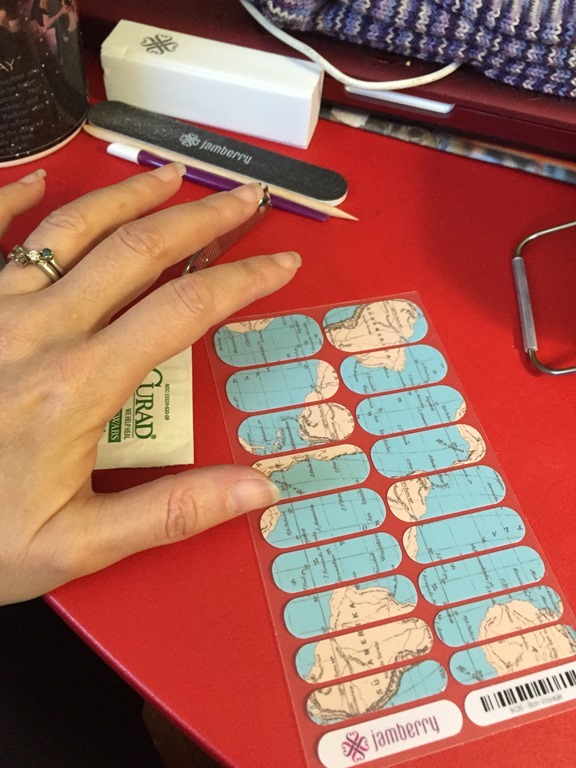 Thanks to a couple of Jamberry parties on Facebook a few weeks back, I found a nifty way to “polish” my nails without giving up the drying time, sitting idle. As someone who barely bothered with the nails (pedis are a totally different matter), I’m really enjoying these wraps. They’re just cool. Here’s what I’m wearing now. 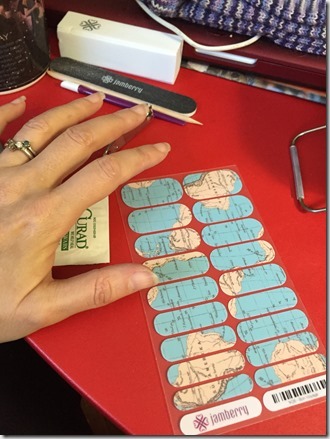 The wraps come on a sheet with enough for two manis and two pedis. 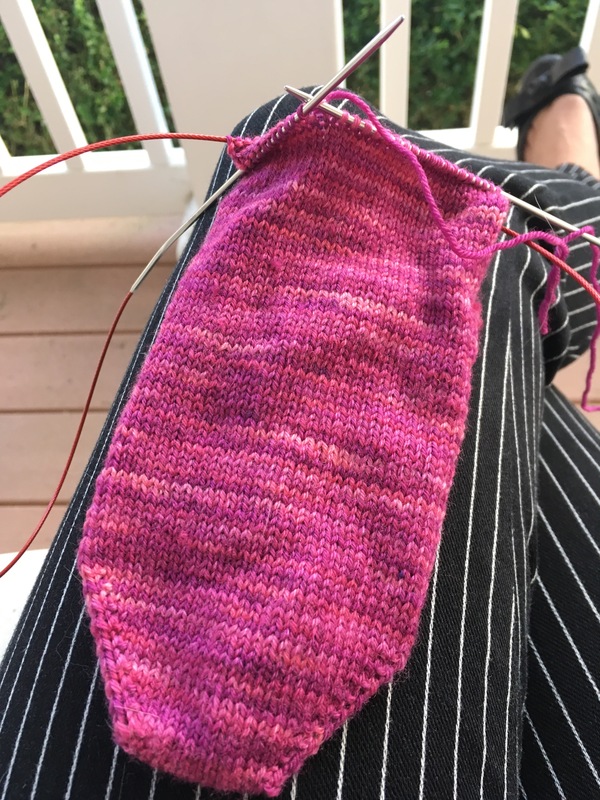 I finished the heel yesterday and started cruising up the leg this morning. Didn’t knit on the ferry but read with a cup of coffee in hand instead. I’m hoping to have this sock finished this week and take a week or so to finish its mate. My goal is to knit 12 pairs, at least, this year. I need to keep up with the influx of new yarn. I’ve noticed that no matter how many sock patterns I collect, I almost always knit the same, plain sock over and over again. The only difference is the yarns used. They are very much mindless in that sense. I guess that makes me a circular sock machine. 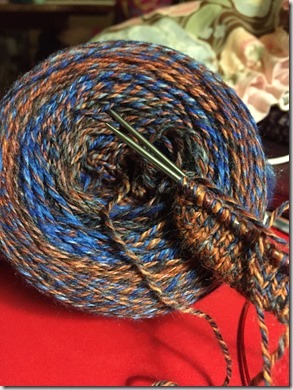 I do need to break out the CSM to start in on the backlog of yarns that I’ve amassed. Maybe this weekend. I’m still not confident enough in it to use the good yarns on it, but I do know I like how the Legare handles much better than the AK’s that I had in the past. Then I’ll have to conquer my fear of the ribber. With the ankle being what it is, I’ve had more sitting around time than I’m normally used to. It is getting better and I managed to commute into the office this morning without too much of a problem. I am sore though and halfway from the ferry thought it had been a bad idea to even try it. Sitting down now, it is much happier. It will be even better when the ibuprofen, which I meant to take before I left the house but didn’t, kicks in. Anyway! 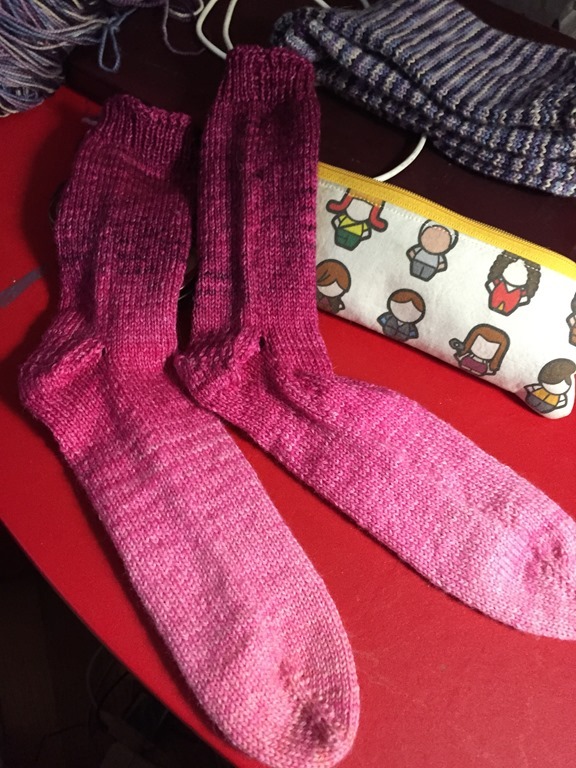 I finally finished that pair of socks. It is safe to say, that was my last pair of two-at-a-time-afterthought-heel socks. I didn’t like the afterthought business, nor was I very happy with the two at a time. 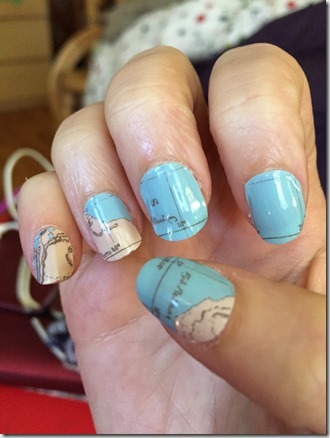 Might be why it took me so darned long to finish them. 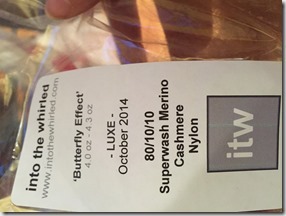 The yarn, as it almost always is, is from itw. The Rav project details are here. 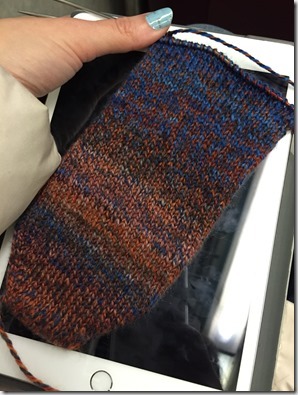 Along the finishing line, I also *finally* wove in the ends on the last pair of socks. These go back a long ways. Didn’t realize they were sitting around waiting for that. These babies are for Miss Kat. And yes, as soon as I was done with my socks, I took care of hers. This meant that it was time for new socks! I haven’t knit with my own handspun in a while, it was time. I recently posted this yarn as I spun it.. 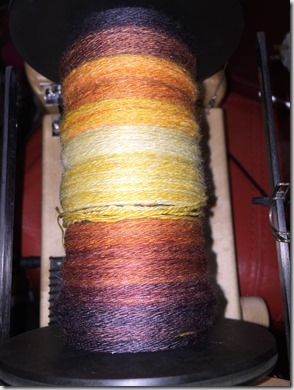 The fiber was spun and plied on my Hansen. I did it a true 3-ply. Love it! 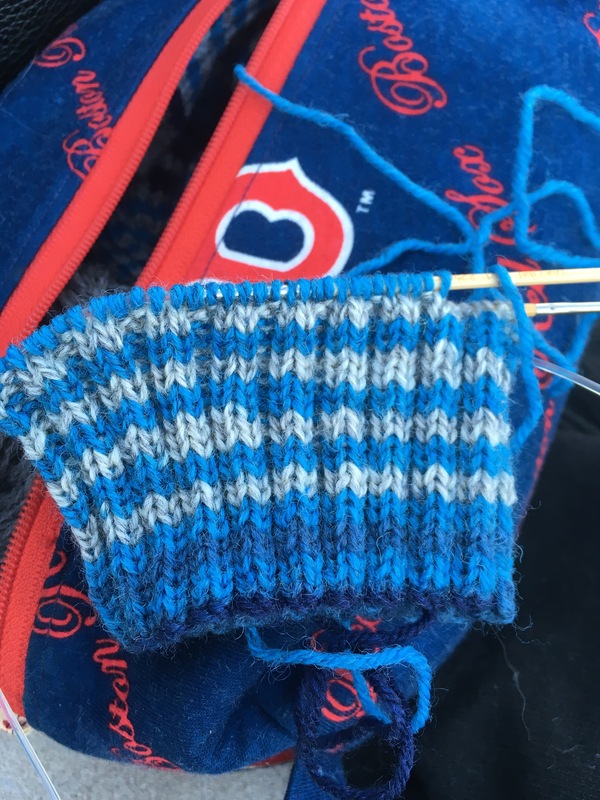 As of getting off the ferry this morning, I am ready to start the heel. Which I didn’t do this evening. Tomorrow is another day. This was my second Emergency Landing, and probably not my last. It’s a nifty little sweater and I’m quite pleased with how it came out. 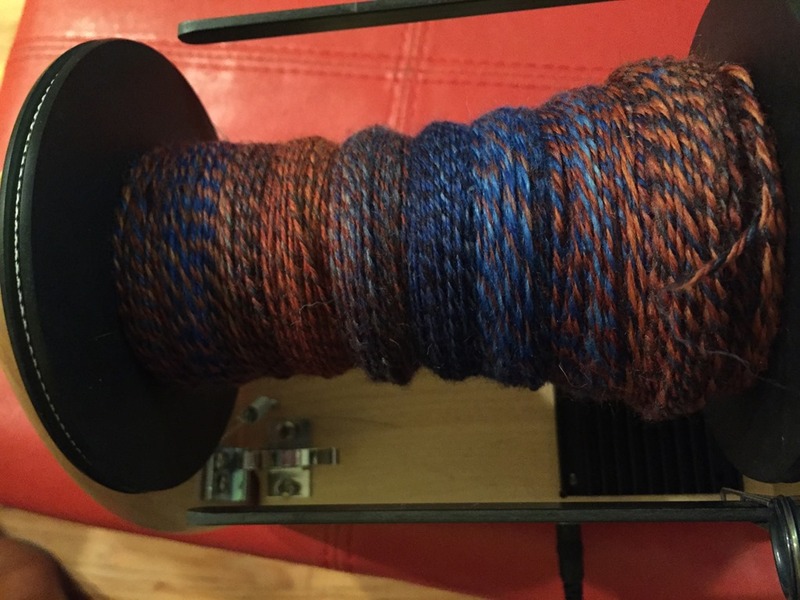 Not to be done there, I also plied more yarn. This final batch is 4oz braid of ITW in Inara, Polwarth/Mulberry silk. I spun it on the Pegasus and n-plied on the Hansen. It shall become socks. Maybe. And on that note, I’m tired and sore. 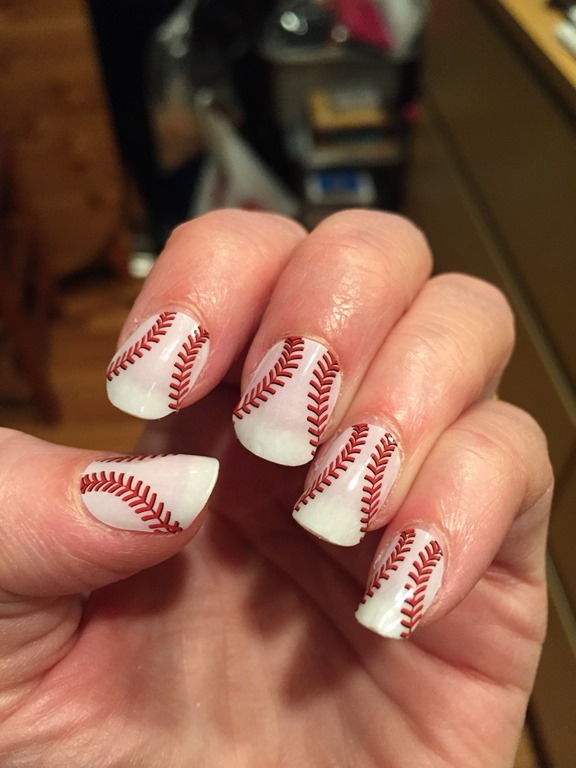 Going to enjoy watching pre-season baseball and call it an early night.